This is probably one of the busiest campsites that we have stayed on to date – a sign of things to come now we have moved into holiday season. It is also close to many local attractions, which makes it even more popular no doubt. Last night, just as we were getting ready for bed, a Transit conversion pulled up next to us to set up camp. Having no inside seating area, they then proceeded to put out table and chairs and cook their tea – at 11 o’clock at night! As we went to bed, I could hear every word they said through the upstairs canvas. Needless to say, when Howard fell quickly asleep and started snoring, I took some small pleasure from the awful din he was making, and unusually for me, didn’t give him a nudge in the side to silence him. Does that make me a bad person?!! This morning, after their late night session, they were still fast asleep as we ate our breakfast and got ready for the day. We walked the short distance down to the train station, and boarded the Flamsbana train, to take the trip up the mountain and back. The Flam railway opened in 1940, and linked those living along the Sognefjord to Bergen and Oslo, via the Bergen Railway. Today, it serves as the premier tourist attraction in Norway, and carries over a million passengers per year. It travels a distance of just over 20km, taking about an hour. It passes through twenty tunnels, and at it’s steepest point, climbs an incline of 55%, making it the steepest standard gauge railway in Northern Europe. It certainly travels through some spectacular scenery, although yet again, the weather was being unkind, with a light drizzle for most of the morning. The journey outward was relatively quiet, with just a handful of other tourists in our carriage. At one point, the train stops by a spectacular waterfall, and allows passengers to disembark to take a photo. As you are stood there admiring the view, some stirring eerie music starts up, and on the rock by the waterfall appears a dancing lady, dressed in red. She is supposed to represent the ‘Huldra’, an underground spirit that captivates travellers with her enchanting song, and tries to lure men into the mountains! All a bit odd, but dutifully everyone took photos. Thankfully, Howard wasn’t lured into the mountain, and we all got back on the train. When we reached the terminus at Myrdal, there were hoards waiting on the platform, and our return journey was much busier. I gained a new travelling companion, a gorgeous Golden Retriever, who sat at my feet, and was just adorable. On my other side, I gained an Asian lady, in sunglasses despite the gloom, who spent the entire journey taking selfies of herself with the view out of the train window. Back at the waterfall on the way down, the same poor lady in the red dress leapt out from behind the rock, and started her strange gyrating dance again. It was still raining, and I couldn’t help but feel that this must be one of the worst jobs out, sitting perched up on a mountainside, in the rain, hiding behind a large boulder by a waterfall, waiting for the train to pass every half an hour. Seems a bummer to me! It turns out, though, that these are students from the Norwegian Ballet School, and it is apparently a very coveted gig to get to do the little ‘Huldra’ Dance. As we approached the final part of our journey back into Flam, I watched my neighbour scroll through her iPhone photos – I counted fifteen selfies! I bet her Facebook page is interesting! Back at the campsite, our Austrian Big White neighbour had been replaced by a Belgian Big White, even closer than the Austrian had parked. The Transit has been replaced by a German Big White, with similar personal space issues. We sat and watched England beat Panama 6 – 1 in the World Cup – hoorah! (Stop booing, you Scots!!). Then to celebrate that the rain had finally stopped, we went for a walk along to Old Flam, to take a look at the church that we had spied from the train. It is a charming old wooden church, dating back to 1667, simply decorated with paintings of animals, vines and landscapes in the ‘naive style’. In 1870, the minister had the wall decorations painted over because he felt his congregation too busy looking at the pictures on the wall, and were not concentrating on his sermon! Thankfully, they were restored finally in 1967. We are now sat outside Oscar, cooking tea, and playing Ed Sheeran as loud as we dare, just to make our point to our incredibly close neighbours. In truth, they probably can’t even hear it, but our little protest is making us feel better! Tomorrow a night in a hotel beckons – and not a moment too soon! Previous Post Day 164 Bergen to Flam, Norway. Next Post Day 166 Flam, Norway. Ps we didn’t cheer 🏴󠁧󠁢󠁳󠁣󠁴󠁿 , we didn’t even know! Glad that you’re enjoying the blog. 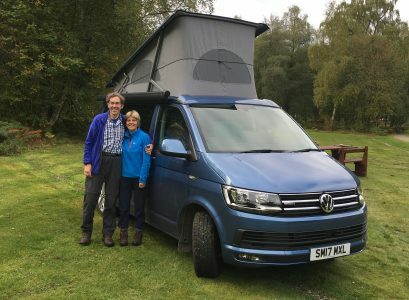 I think only people who travel in small campervans will understand my gripes about the Big Whites – although I must admit that on rainy days, I do rather envy their copious space! Yes … I feel the same way!